Having grown up in 4-H, I've always found the county fair and state fair exciting! 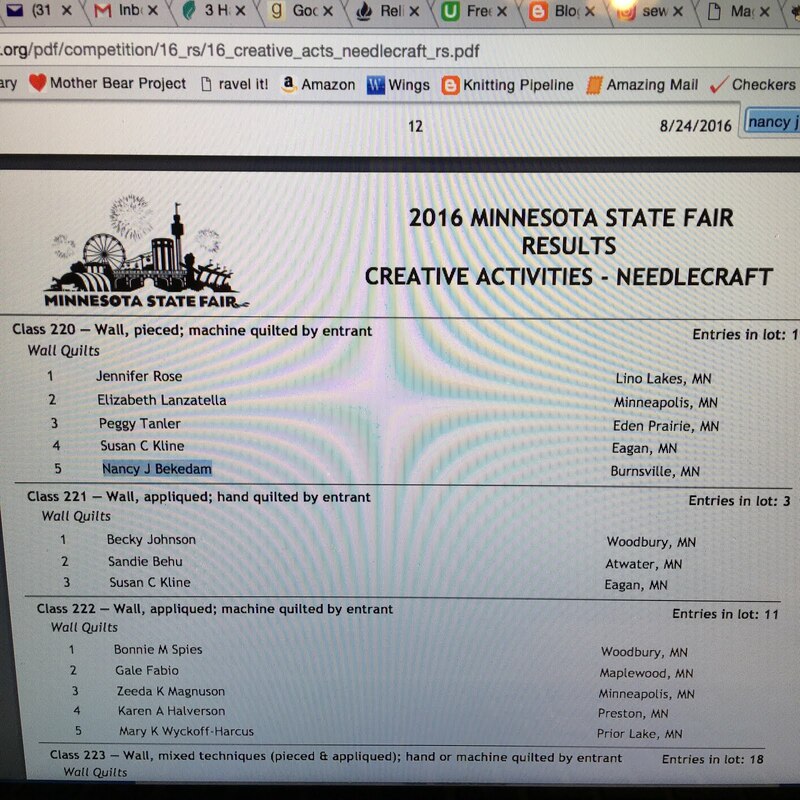 I entered my quilts in three fairs this summer, with various degrees of success!?! The first was the Washington County fair, my hometown fairgrounds that I'm most familiar with. 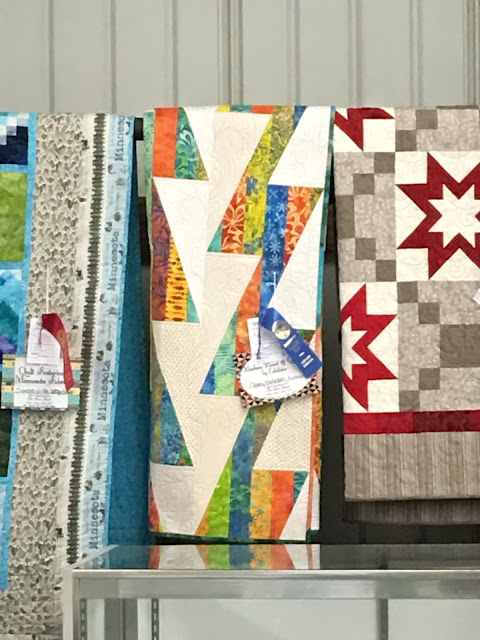 I entered 7 quilts this year. My best success there was my Bob and Weave quilt, which got a blue ribbon, plus recognition from Bear Patch Quilting. 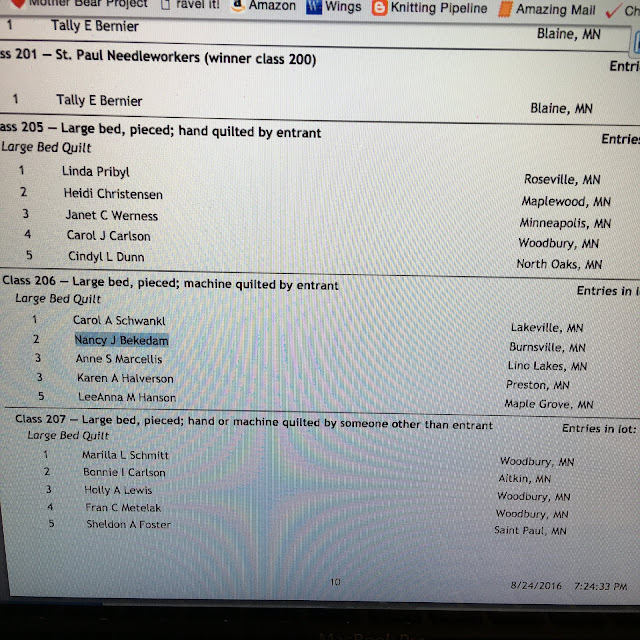 The reason for recognition wasn't stated! But I did get a $10 gift certificate for their shop, which was appreciated. Next came the Dakota County Fair, our current resident fair. 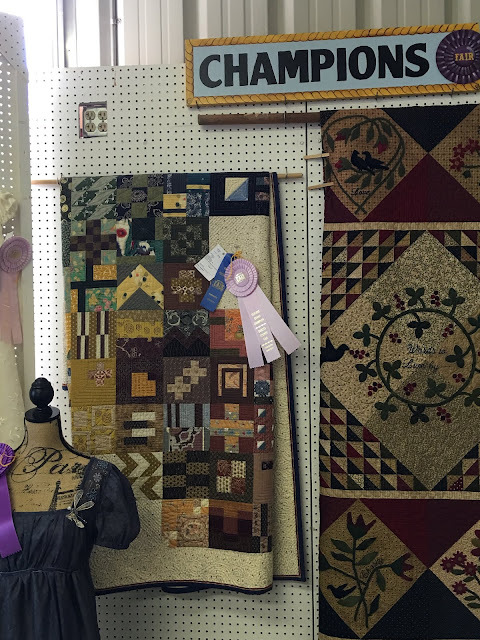 I entered 7 different quilts from the Washington County Fair entries, as the 2 county fairs overlapped. I was thrilled to get Reserve Grand Champion on my Tsukubai quilt! 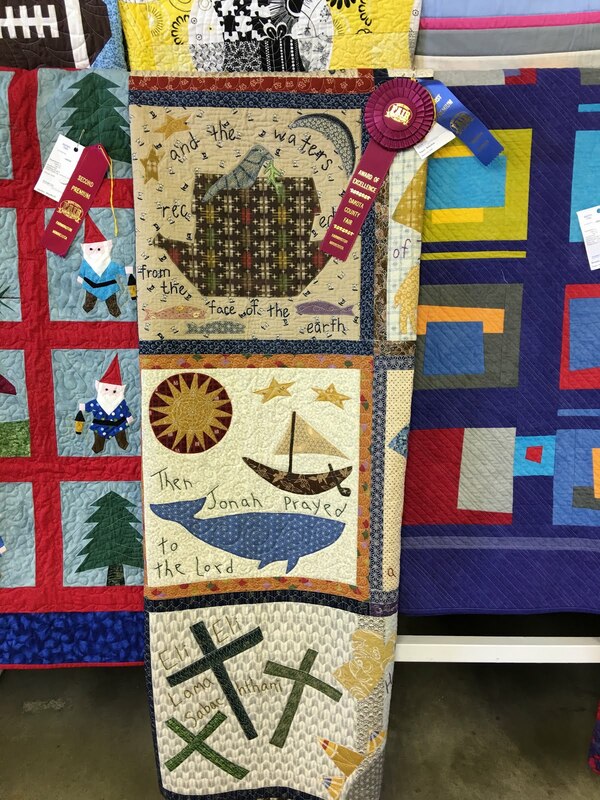 My Bible Story quilt also received an award of excellence ribbon, along with a blue ribbon! I brought 3 quilts to the Minnesota State Fair, the day after I picked up my quilts from the Dakota County Fair. 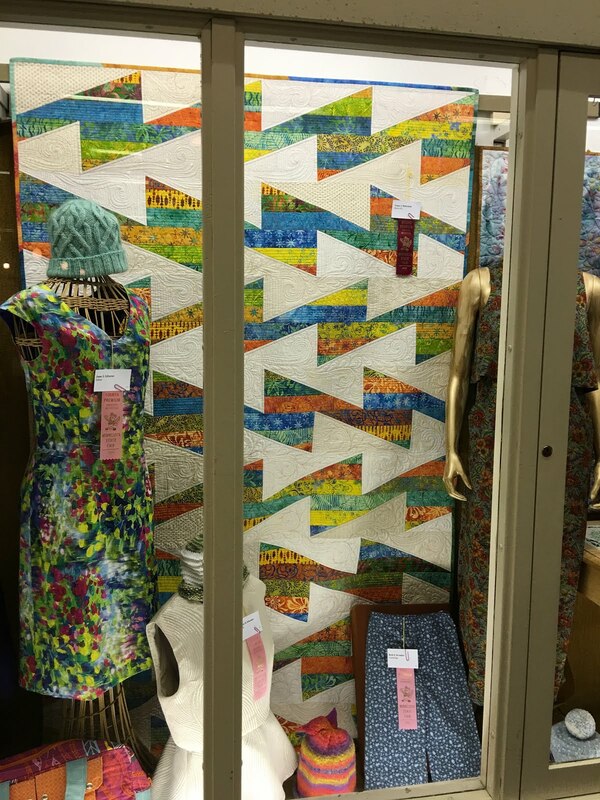 My Bob and Weave quilt received 2nd place in the "large pieced quilt, machine quilted by entrant" category. They put all Creative Arts entries in displays together, so my quilt was on display with a couple of wild colored dresses! 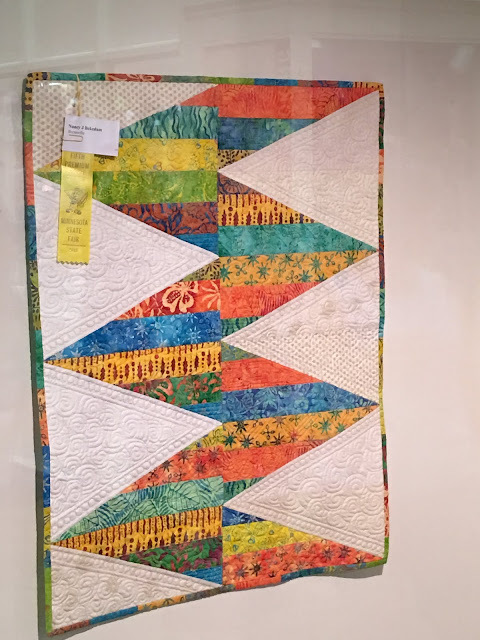 My ZigZag wallhanging received 5th place in the "wall quilt, pieced, quilted by entrant" category, right after my guild friend, Susan Klein, who got 4th place. And my third entry at the Minnesota State Fair was my Japanese Lone Star quilt. It did not receive a ribbon, although it was noted on my evaluation that it was in 6th place in it's category. It took us quite a bit of hunting to find it! 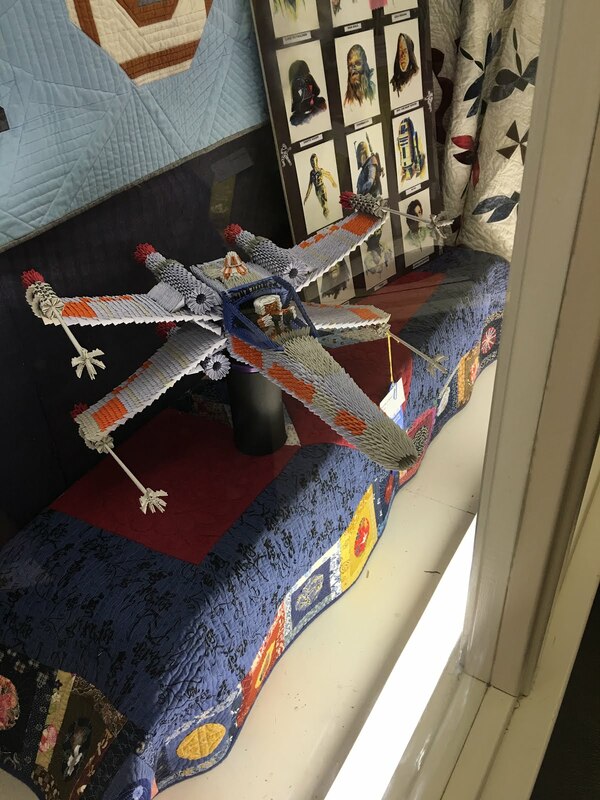 It was used as a tablecloth for several Star Wars items. I'm just sharing my best successes here. I did get some lower ribbons. But as my dear husband says, cast your nets wide and see what you come up with! Very impressive. It's always motivating to see that other people like your quilts. Congrats. Thank you!!! Those ribbons are equal to a good pat on the back! Congrats on all your ribbons. You have beautiful quilts!! Well done, Friend! Lovely quilts. I love that the fair tradition transcends modern times. Ohhh, thank you, Paula! So true--there's nothing better than a good old fashioned county fair. Catching up on blogs this morning-congratulations on your success! Well deserved! Thanks, Kathy! I'm still surprised by what quilt gets what ribbon. Ribbons are so affirming.